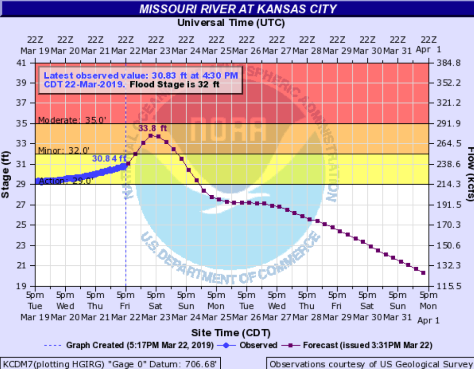 Missouri River now expected to crest on Saturday night in KC – Welcome to Wyandotte Daily! Water was in the fields on the west side of I-435 near the Missouri River in Wyandotte County, in this photo taken on Friday afternoon. The Missouri River at I-435 in Wyandotte County is currently at moderate flood stage. It is projected to crest on Saturday night. A view of the Wyandotte County side of the Missouri River at I-635 on Friday afternoon. The river is in moderate flood stage and is projected to crest on Saturday night. Wyandotte County will have a little longer to wait for the projected crest of a flood on the Missouri River. 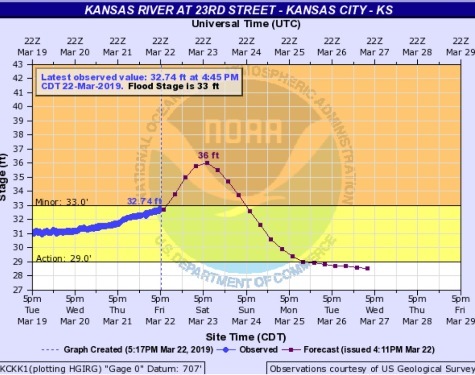 This afternoon, a Corps of Engineers official stated in a news conference that the Missouri River at Kansas City now is anticipated to crest on Saturday night. The Missouri River’s crest reached St. Joseph, Missouri, today, according to Corps officials, and some residents there were being evacuated. River forecasts have been adjusted several times a day as river flows are changing upstream. When levees break, the flow of water in the river changes, some water comes out of the river, a different amount of water then re-enters the river, and projected crests are readjusted. The Missouri River at Parkville, whose coverage area includes Wyandotte County, has been at moderate flood stage for several days. 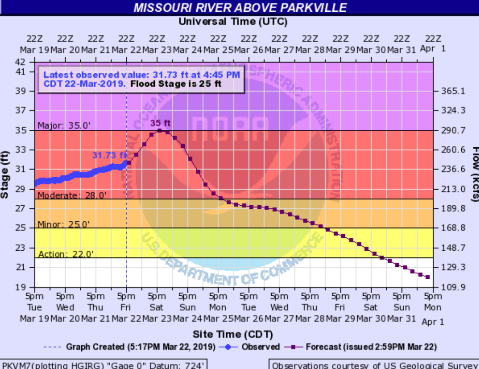 On Friday evening, the National Weather Service predicted that the Missouri River at Parkville, a gauge that includes Wyandotte County, would rise to 35 feet on Saturday night. The river at this point was at 31.73 feet at 4:45 p.m. Friday, March 22. At 32 and 32.5 feet, the Wolcott levee sections in Wyandotte County are overtopped. The river at this point is projected to remain in moderate flood stage through Monday, then decline out of minor flood stage on Thursday, according to a hydrology chart. Areas to the north of Kansas City have been hit hard by flooding, including St. Joseph, Missouri, Atchison, Kansas, and Leavenworth, Kansas, and areas surrounding those cities. The river at Leavenworth could crest on Saturday evening after going into major flood stage, according to weather forecasters. The water releases into the Missouri River from the Gavins Point dam in South Dakota remain at 24,000 cubic feet per second today, Corps officials stated. More snow melting in the Dakotas is now entering the system, and water releases from Fort Randall dam, which had been reduced to zero, now will resume at 4,000 cfs Saturday and 12,000 cfs Sunday, according to Corps officials. It will take the water about a day and a half to travel from Fort Randall dam to Gavins Point dam. 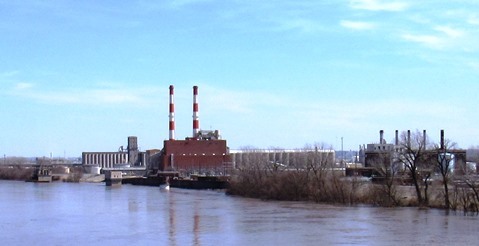 Releases from Gavins Point will not now be reduced to 20,000 cfs, according to Corps officials. Instead, the releases are projected to increase to 32,000 cfs when the crest on the Big Sioux River upstream reaches Sioux City. According to Corps officials from the Kansas City district, about a half-million sandbags have now been issued, and the Corps is providing relief and support to state and local governments who request assistance. The flood has already broken three records upstream, according to National Weather Service officials. This includes at Plattsmouth, Nebraska City and Brownville in Nebraska. A Corps of Engineers official said it was the largest inflow and largest volume of water into the Gavins Point pool from the Niobrara River area for the past 120 years. On Thursday, Kansas Gov. Laura Kelly toured Kansas counties damaged by flooding. She flew by helicopter to Leavenworth and then up the Missouri River Basin to survey the damage and relief efforts. Gov. Kelly signed an executive order Wednesday easing motor carrier regulations to help with emergency relief and restoration. Last week, she issued a state of disaster emergency declaration for counties affected by flooding. To see charts with updated river levels, visit https://water.weather.gov/ahps2/index.php?wfo=eax. Water was in the fields to the side of I-435 near the Missouri River in Wyandotte County, at a location in the Wolcott area, in this photo taken Friday afternoon. The Missouri River is in moderate flood stage at this point, and is expected to crest on Saturday night. Water was seen outside of the Missouri River in fields to the side of I-435 in Wyandotte County on Friday afternoon. The river is in moderate flood stage at this point. Water was seen in fields on Wolcott Drive near 105th, where a grain elevator is located, south of the Missouri River. The Missouri River as seen on Friday afternoon at I-635 in Wyandotte County. The river is in moderate flood stage and is expected to crest on Saturday night. The Missouri River as seen on Friday afternoon at I-635 in Wyandotte County.